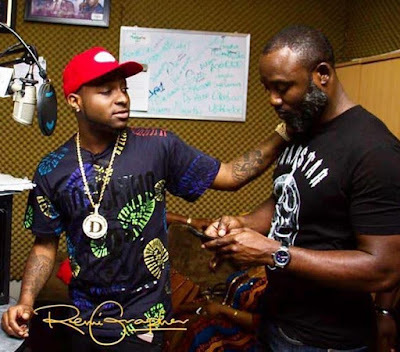 Nigerian music star Davido and his manager Kamal, are going through some funny issues right now.If what we have been seeing unfold in social media is anything to go by,the two camps have gone their separate ways. But then it all went quiet and there were even some reports that it was all a jone and everything was fine in the camp. But after noticing that recently,Davido has done quite a lot of news worthy things including his performance at AFCON, signing a new artiste and even releasing a new song with Mayorkun but through all these, Kamal stayed usually silent on social media. Kamal all through his 4 years with OBO has never stayed quite on social media whenever his client had an event or a song to promote.His last Instagram post was a photo of himself almost 3 weeks ago! Things took a new turn when that man who likes trouble,Special Spesh the hype man turned things up another decibel. 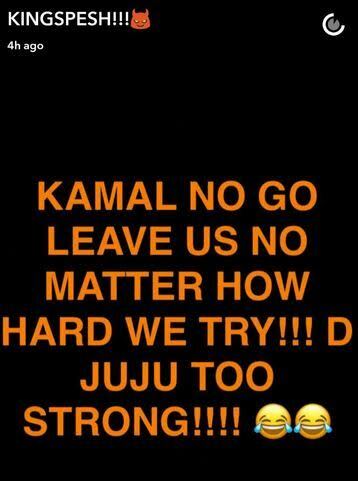 He posted a message on Snapchat that allegedly indicates Kamal uses 'Juju' on his friend. His message reads, 'Kamal no go leave us no matter how hard we try! The Juju too strong'. This is not the first time Davido will split from a manager.If you recall,in the early stages of his career,he broke up with the man who many said worked very hard behind the scenes to get him where he is today, Asa Asika.The story then was,he was getting higher than the new to the game Asa could handle and he needed somebody with maturity and experience who could handle his new status.I guess Kamal has also gone past his sell by date. They need to be careful how they treat the guy though,he worked with the Dami Duro and Aye singer for 4 years,so he knows where all the skeletons are buried.He must have so many secrets about the star.You know what they say about an ex scorned? He who has ears,let him hear and learn.